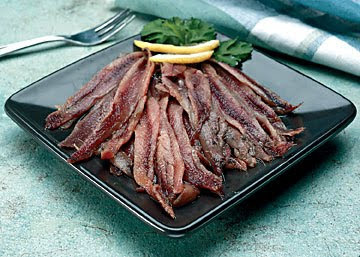 I admit, anchovies look strange. But they are so salty and creamy, just begging to be turned into a sauce! Tonight, I used this 4-step method to create a red fish with garlic anchovy sauce. I slightly burned the garlic (those are the black crispy bits below) and my house smelled strange, but the dish tasted fantastic. This is a keeper, ladies and gentleman, and it was on the table in 15 minutes. Serve with roasted broccoli. Red Fish with Garlic Anchovy Sauce 1 cup flour 2 fillets red fish (I used Rockfish, but bass or salmon would work too) 2 ounces anchovies packed in oil 1 small shallot, finely diced 2 cloves garlic, finely diced 1 cup dry white wine 2 tablespoons butter Extra virgin olive oil 1. Dredge fish in flour, and add to sizzling hot olive oil in a cast iron skillet. Cook fish about 3-4 minutes each side until it flakes easily. Place fish on plate and tent with foil. 2. Add shallots and garlic to the oil and drippings in the hot pan. Add more oil if necessary, and scrape up any bits on pan. Add anchovy fillets and let melt into sauce, about 2 minutes. 3. Add 1 cup dry white wine and stir until reduced by half. 4. Remove from heat and whisk in butter until fully combined. Return fish to pan to heat through and coat with sauce.